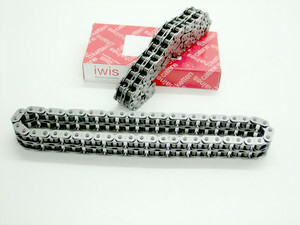 IWIS are world-renowned manufacturers of the ultimate in automotive cam drive chains. It has taken me some years to be able to buy product from their sales team. As a company they only deal in selling in bulk. Fortunately I have discovered a source that will sell to me in relatively small quantities. This duplex chain is simply the ultimate on the market. The actual chain design has long been the choice of engine manufacturers and builders for everything up to and including monstrous output racing engines such as used in F1 and GT type cars. This chain is as good as it gets. I have been using these chains since I came across them sold with the excellent but no longer available Rollmaster duplex cam drive kits made in Australia. They have proven to out live all other chains by miles and miles - including in racing. The generally available budget priced chains stretch to near uselessness after three, may be four races - so half a season. These chains will do two full seasons without issue. Some may think them a bit costly when you can buy a Duplex kit for less. My answer is - quality isn't expensive, it's priceless. You get what you pay for.